The human body is composed of thousands of different types of cells that carry out a wide range of specialized functions and work together to maintain optimal health and physical function. Some of the major cell types that coordinate the vast functions throughout the body include muscle cells, nerve cells and red blood cells. Muscle cells are the building blocks of three types of muscle: skeletal muscle, smooth muscle and cardiac muscle. When a group of individualized muscle cells that are bundled together shorten, or contract, in a coordinated fashion, movement is produced. Skeletal muscle, composed of thousands of muscle cells, attaches to bones and powers movement. People have voluntary control over most skeletal muscle, so movements can be powerfully and skillfully controlled through the interaction of groups of muscle cells and the nerves that control them. Exercise can train muscle cells by stimulating them to grow bigger, develop increased efficiency and multiply. Likewise, when muscles are not used, as when people are bedridden for long periods, muscle cells may atrophy, or shrink and die, causing weakness. Movement of the heart, blood vessel walls and many body organs are also controlled by muscle. The heart pumps due to contraction of a unique type of muscle cell that is only located in the heart. Cardiac muscle cells pace themselves to contract the heart in a coordinated fashion, sending blood throughout the body without any conscious or deliberate input. Another type of muscle cell, smooth muscle, lines the arteries, stomach, intestines and trachea, among many other organs in the body. Smooth muscle is composed of an involuntary type of muscle cell, meaning that it functions without purposeful control. Smooth muscle cells contract and relax as needed to enable organs to move, controlling functions such as digestion, breathing, swallowing, urinating and carrying blood throughout the body. Nerve cells are complex cells with extensions called axons and dendrites that receive and send electrical communication signals, facilitating communication between distant parts of the body. Nerve cells actually do not take up a large space, but they play a critical role in integrating sensations and movements. Each motor nerve cell controls a designated group of muscle cells, and the nerve cell combined with the muscle cells it controls is called a motor unit. Unlike many cell types, nerves are not easily regenerated when they are damaged, which makes nerve, spine and brain damage particularly devastating. Red blood cells flow through the heart and blood vessels to deliver oxygen to cells throughout the body, including the nerve and muscle cells. They carry hemoglobin, a protein that binds oxygen and carbon dioxide, and deliver oxygen to each cell for the use of energy; they also remove carbon dioxide waste from each cell to be released from the lungs. Additionally, red blood cells have common self-identifying markers on their surfaces, called ABO and Rh. The ABO and Rh markers on the surface of one individual and another unrelated individual can be easily tested for compatibility. This allows a blood transfusion when blood types of donor and recipient match. How Are the Muscular & Nervous Systems Connected? 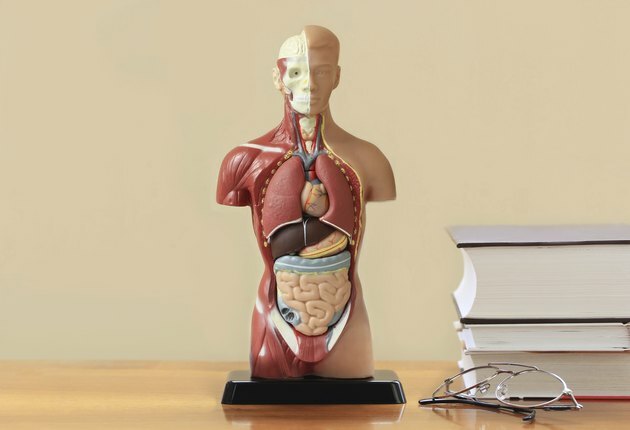 What Organs Make Up the Muscular System?